For falls, lacerated wounds, and septic wounds. Calendula officinalis is the great homeopathic antiseptic and vulnerary (wound healing herb). Germs cannot thrive in the presence of Calendula officinalis. Calendula officinalis cream will draw out dirt that is embedded deeply in the wound. Apply Calendula Officinalis Cream topically to all wounds where the skin is broken. If even with the application of Calendula Officinalis Cream topically, the wound begins to look infected, take Calendula officinalis 30C internally, and it will heal that wound up promptly. Calendula officinalis is listed in my repertory for painful wounds, wounds that do not heal, chronic effects from wounds, wounds that tend to break open and heal again, dissecting wounds, festering wounds, gangrenous wounds, gaping wounds, inflammation of wounds, neglected wounds, suppurating wounds, and lacerated, torn or ragged wounds. Gunshot wounds. Calendula officinalis prevents suppuration and infection of gunshot wounds. Diaper rashes. Calendula Officinalis Cream is very helpful to heal up minor diaper rashes of babies. Some babies are sensitive to the cream. For this reason we have created the Calendula Officinalis Butter, which does not have any alcohol in it, and therefore should not sting. Calendula officinalis promotes healthy granulation of the tissues and prevents peritonitis after surgery. Soothing relief during and after delivery. A compress of Calendula officinalis tincture dissolved in warm water and applied to the perineum during and after labor can be very soothing and healing to the laboring mother. Applying Calendula officinalis cream topically can also be beneficial. Calendula officinalis helps with the maturation and healing of abscesses. Calendula officinalis can help soothe the skin following sunburns. Calendula Officinalis is the principal remedy in homeopathy for wound healing. 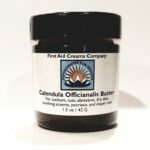 Calendula Officinalis Butter is the perfect topical application to put on open cuts. No germs can thrive in the presence of Calendula. It can draw out deeply embedded dirt. Calendula is wonderful for minor cuts, scrapes and falls. Calendula prevents too early granulation of the wound, thus assisting in scarless healing. Calendula helps with painful wounds and wounds that tend to break open. Calendula Officinalis Butter is good for the diaper rashes of babies. Calendula can soothe the dry skin of eczema and psoriasis. Here is a comparison of Calendula Officinalis Cream and Calendula Officinalis Butter. Made with Organic Calendula officinalis. tincture. Made with with Organic Calendula Officinalis oil. Due to the presence of water in the cream, it needs a preservative. No preservative is necessary, because there is no water in the formula. The color is whiter and the texture creamier. The color is yellow and the texture is buttery and firm. Possibly stings on open wounds because of the alcohol. Unlikely to sting since there is no alcohol in the formula. We recommend the Calendula Officinalis Butter for babies with diaper rashes, people with eczema, psoriasis or any skin condition where the skin is broken open, as the absence of alcohol should minimize stinging when applied. Here is a link to the Learn About Calendula Officinalis Cream Page. Active ingredients: 12.5% Organic Calendula Officinalis Oil HPUS. Inactive ingredient: Deodorized Cocoa Butter, Sunflower Oil, Olive oil and Vitamin E. We hope you will love our new simple Calendula formula, which is free of chemical preservatives. Active ingredients: 12/5% Organic Calendula Officinalis Tincture HPUS. Inactive ingredients: An emulsified base of Distilled Water, Coconut OIl, Sunflower Oil, Vegetable Emulsifying Wax, Conconut Oil, Phenoxyethanol, Capylyl Glycol, Borax.